The Tesla car of British TV director Mr Michael Morris, who currently works on the Netflix series ’13 Reasons Why’ was told by a couple driving next to him that his car was on fire. 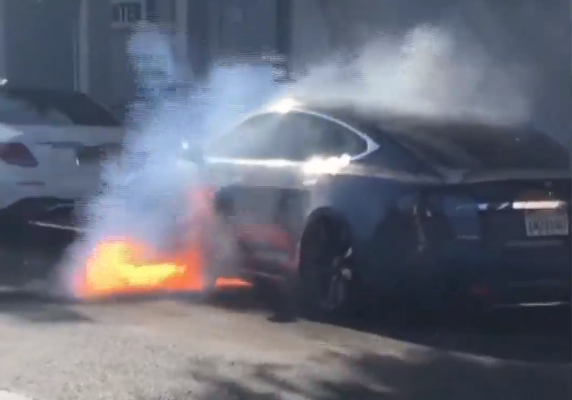 As Mr Morris parked the Tesla, the flames soon overtook the car itself and started to consume the vehicle entirely. A local firefighter team was able to put out the flames before it could damage other cars as well. Ms Mary McCormack made it clear afterwards that the car "wasn't a Tesla with autopilot or whatever. It was a normal Tesla." A Tesla spokesperson stated: "We offer our support to local authorities and are glad our customer is safe. This is an extraordinarily unusual occurrence, and we are investigating the incident to find out what happened." The incident, another one in a long line of accidents this year, comes at a very unfavorable time for Tesla as it was forced to fire some 10% of its personnel this week. Many employees blamed CEO Elon Musk for not living up to his promises. Been saying this for years. Elon Musk is a crook. As time progresses you will all understand. Brings an entirely new meaning to the word 'Burnout'! Rather unfortunate incident. Could happen with any other vehicle, not fair to blame Elon musk for this.